I’ve been waiting for this feature since quite a while and its finally here and working. CloudForms 4.2 and OpenShift 3.4 have the ability combined of scanning docker images and define if the images are compliant or not. 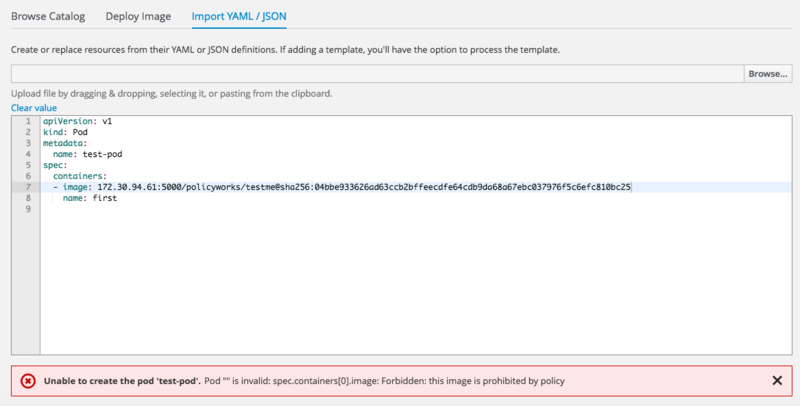 If the image is not compliant CloudForms annotates the image in OpenShift with images.openshift.io/deny-execution: true and if OpenShift is configured correctly it will deny execution the next time someone tries to run the container image. Having this feature is really awesome as you can prevent someone from building a vulnerable image and deploying it multiple times. Also CloudForms can either have a policy set on the provider which auto scans newly discovered pods/images, schedule image registry scans or your check images on demand. 2. Restart the OpenShift masters so that the policy will take effect. 3. Deploy a vulnerable image in OpenShift. In my case I named it testme. 4. Go to CloudForms and run a Smart State Analysis. Login to CloudForms and go to Compute -> Containers -> Container Images and choose the image you’ve just deployed via OpenShift. 7. Go to policy -> manage policy and check the box for OpenScap Profile Once checked go back to the policies and run “Check Compliance of last known configuration. 8. As I used a image which has known vulnerabilities the compliance status will show Non-Compliant. 11. Lets see if the policy catches and build a new container based of the above. As you can see below OpenShift denies running the above image!